↑ Read, p.482: "After the obligatory wrangles, with Jinnah playing for time by suggesting calling in the United Nations, which could have delayed things for months if not years, it was decided to set up two boundary commissions, each with an independent chairman and four High Court judges, two nominated by Congress and two by the League." ↑ Mishra, para. 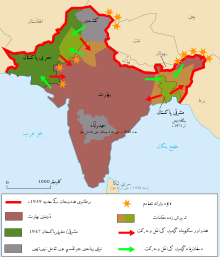 19: "Irrevocably enfeebled by the Second World War, the British belatedly realized that they had to leave the subcontinent, which had spiraled out of their control through the nineteen-forties. ... But in the British elections at the end of the war, the reactionaries unexpectedly lost to the Labour Party, and a new era in British politics began. As von Tunzelmann writes, 'By 1946, the subcontinent was a mess, with British civil and military officers desperate to leave, and a growing hostility to their presence among Indians.' ... The British could not now rely on brute force without imperiling their own sense of legitimacy. Besides, however much they 'preferred the illusion of imperial might to the admission of imperial failure,' as von Tunzelmann puts it, the country, deep in wartime debt, simply couldn’t afford to hold on to its increasingly unstable empire. Imperial disengagement appeared not just inevitable but urgent." ↑ Read, p.484: Years later, he told Leonard Mosley, "The heat is so appalling, that at noon it looks like the blackest night and feels like the mouth of hell. After a few days of it, I seriously began to wonder whether I would come out of it alive. I have thought ever since that the greatest achievement which I made as Chairman of the Boundary Commission was a physical one, in surviving."